Feathers add an unexpected element to holiday crafts. This DIY turkey feather wreath by Make + Haus goes straight from Thanksgiving into the holidays. If you don't have space for a wreath, stitch up versatile table linens with Luxe Feathers in Plum by Sparrowsong for a sophisticated twist on a traditional table setting. 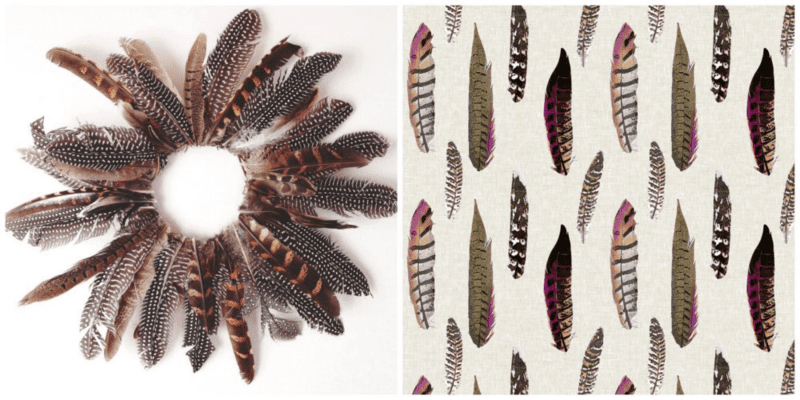 We've got ten lovely feather fabrics to admire in this week's top ten, but the winner comes from UK designer — and first-time contest winner –Alex Morgan (Spellstone). Congratulations, Alex! Wear Feather Fabrics… And Vote for Your Favorites! The contest theme this week is feathers and we received a big, fluffy pillow's worth of entries (221). Vote for all your favorites and we'll tickle you with the winner next Thursday. [Read more…] about Wear Feather Fabrics… And Vote for Your Favorites!